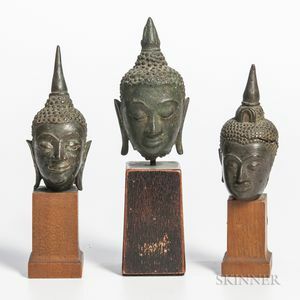 Three Bronze Buddha Heads, Southeast Asia, one Thailand, Ayutthaya-style, possibly 16th century; and two possibly Laos, Lanxang-style with pointed ushnisha, all mounted on wood stands, heads ht. to 3 1/2 in. 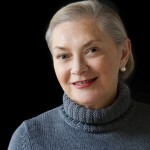 Provenance: Purchased from Parke-Bernet Galleries in the 1960s. one Laos cracked and repaired to the back, one with spotty patinas to face, one thailand, cracked and lost part to the back.